"Clausius" redirects here. For the lunar crater, see Clausius (crater). 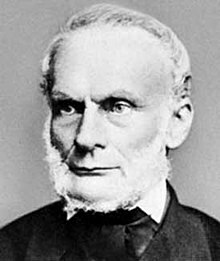 Rudolf Julius Emanuel Clausius (German pronunciation: [ˈʁuːdɔlf ˈklaʊ̯zi̯ʊs]; 2 January 1822 – 24 August 1888) was a German physicist and mathematician and is considered one of the central founders of the science of thermodynamics. By his restatement of Sadi Carnot's principle known as the Carnot cycle, he gave the theory of heat a truer and sounder basis. His most important paper, "On the Moving Force of Heat", published in 1850, first stated the basic ideas of the second law of thermodynamics. In 1865 he introduced the concept of entropy. In 1870 he introduced the virial theorem which applied to heat. Clausius was born in Köslin (now Koszalin in Poland) in the Province of Pomerania in Prussia. His father was a Protestant pastor and school inspector, and Rudolf studied in the school of his father. After a few years, he went to the Gymnasium in Stettin (now Szczecin). Clausius graduated from the University of Berlin in 1844 where he studied mathematics and physics with, among others, Gustav Magnus, Peter Gustav Lejeune Dirichlet and Jakob Steiner. He also studied history with Leopold von Ranke. During 1847, he got his doctorate from the University of Halle on optical effects in Earth's atmosphere. He then became professor of physics at the Royal Artillery and Engineering School in Berlin and Privatdozent at the Berlin University. In 1855 he became professor at the ETH Zürich, the Swiss Federal Institute of Technology in Zürich, where he stayed until 1867. During that year, he moved to Würzburg and two years later, in 1869 to Bonn. In 1870 Clausius organized an ambulance corps in the Franco-Prussian War. He was wounded in battle, leaving him with a lasting disability. He was awarded the Iron Cross for his services. His wife, Adelheid Rimpham, died in childbirth in 1875, leaving him to raise their six children. He continued to teach, but had less time for research thereafter. In 1886, he married Sophie Sack, and then had another child. Two years later, on 24 August 1888, he died in Bonn, Germany. Clausius's PhD thesis concerning the refraction of light proposed that we see a blue sky during the day, and various shades of red at sunrise and sunset (among other phenomena) due to reflection and refraction of light. Later, Lord Rayleigh would show that it was in fact due to the scattering of light, but regardless, Clausius used a far more mathematical approach than some have used. His most famous paper, Ueber die bewegende Kraft der Wärme ("On the Moving Force of Heat and the Laws of Heat which may be Deduced Therefrom") was published in 1850, and dealt with the mechanical theory of heat. In this paper, he showed that there was a contradiction between Carnot's principle and the concept of conservation of energy. Clausius restated the two laws of thermodynamics to overcome this contradiction (the third law was developed by Walther Nernst, during the years 1906–1912). This paper made him famous among scientists. Clausius' most famous statement of thermodynamics second law was published in German in 1854, and in English in 1856. Heat can never pass from a colder to a warmer body without some other change, connected therewith, occurring at the same time. During 1857, Clausius contributed to the field of kinetic theory after refining August Krönig's very simple gas-kinetic model to include translational, rotational and vibrational molecular motions. In this same work he introduced the concept of 'Mean free path' of a particle. Clausius deduced the Clausius–Clapeyron relation from thermodynamics. This relation, which is a way of characterizing the phase transition between two states of matter such as solid and liquid, had originally been developed in 1834 by Émile Clapeyron. In 1865, Clausius gave the first mathematical version of the concept of entropy, and also gave it its name. Clausius chose the word because the meaning (from Greek ἐν en "in" and τροπή tropē "transformation") is "content transformative" or "transformation content" ("Verwandlungsinhalt"). He used the now abandoned unit 'Clausius' (symbol: Cl) for entropy. The energy of the universe is constant. The entropy of the universe tends to a maximum. Honorary Membership of the Institution of Engineers and Shipbuilders in Scotland in 1859. Fellow of the Royal Society of London in 1868 and received its Copley Medal in 1879. Member of the Royal Swedish Academy of Sciences in 1878. Honorary doctorate from the University of Würzburg in 1882. Foreign Member of the Royal Netherlands Academy of Arts and Sciences in 1886. The lunar crater Clausius named in his honor. Clausius, R. (1867). The Mechanical Theory of Heat – with its Applications to the Steam Engine and to Physical Properties of Bodies. London: John van Voorst. English translations of nine papers. Hans Peter Jørgen Julius Thomsen, one of the founders of the thermochemistry. ^ Dudenredaktion; Kleiner, Stefan; Knöbl, Ralf (2015) [First published 1962]. Das Aussprachewörterbuch [The Pronunciation Dictionary] (in German) (7th ed.). Berlin: Dudenverlag. pp. 280, 744. ISBN 978-3-411-04067-4. ^ Krech, Eva-Maria; Stock, Eberhard; Hirschfeld, Ursula; Anders, Lutz Christian (2009). Deutsches Aussprachewörterbuch [German Pronunciation Dictionary] (in German). Berlin: Walter de Gruyter. pp. 416, 884. ISBN 978-3-11-018202-6. ^ a b c Clausius, R. (1867). The Mechanical Theory of Heat – with its Applications to the Steam Engine and to Physical Properties of Bodies. London: John van Voorst. Retrieved 19 June 2012. Contains English translations of many of his other works. ^ Clausius, RJE (1870). "On a Mechanical Theorem Applicable to Heat". Philosophical Magazine. 4th Series. 40: 122–127. ^ a b Cropper, William H. (2004). "The Road to Entropy Rudolf Clausius". Great Physicists: The Life and Times of Leading Physicists from Galileo to Hawking. Oxford University Press. pp. 93–105. ISBN 978-0-19-517324-6. Retrieved 25 March 2014. ^ Clausius, R. (1850). "Ueber die bewegende Kraft der Wärme und die Gesetze, welche sich daraus für die Wärmelehre selbst ableiten lassen". Annalen der Physik. 79 (4): 368–397, 500–524. Bibcode:1850AnP...155..500C. doi:10.1002/andp.18501550403. . See English Translation: On the Moving Force of Heat, and the Laws regarding the Nature of Heat itself which are deducible therefrom. Phil. Mag. (1851), series 4, 2, 1–21, 102–119. Also available on Google Books. ^ Clausius, R. (1854). "Ueber eine veränderte Form des zweiten Hauptsatzes der mechanischen Wärmetheoriein". Annalen der Physik und Chemie. 93 (12): 481–506. Bibcode:1854AnP...169..481C. doi:10.1002/andp.18541691202. Retrieved 25 June 2012. ^ Clausius, R. (August 1856). "On a Modified Form of the Second Fundamental Theorem in the Mechanical Theory of Heat". Phil. Mag. 4. 12 (77): 81–98. doi:10.1080/14786445608642141. Retrieved 25 June 2012. ^ Clausius, R. (1864), Abhandlungen über die Mechanische Wärmetheorie. Electronic manuscript from the Bibliothèque nationale de France. ^ "R.J.E. Clausius (1822 - 1888)". Royal Netherlands Academy of Arts and Sciences. Retrieved 21 July 2015. Wikimedia Commons has media related to Rudolf Clausius. O'Connor, John J.; Robertson, Edmund F., "Rudolf Clausius", MacTutor History of Mathematics archive, University of St Andrews . Chisholm, Hugh, ed. (1911). "Clausius, Rudolf Julius Emmanuel" . Encyclopædia Britannica (11th ed.). Cambridge University Press.